I went for my 'final' skin cancer check-up this morning, taking a bottle of Tequila along as a thank you gift for the Specialist, thinking this was my last appointment...wrong! Unfortunately a mark on my back that he has been monitoring for over a year now, appears to have enlarged and changed colour, so he wants at least one more appointment in two months time, if it is still suspect, then it is surgery for a biopsy, if not he will discharge me. He then went on to freeze a number of 'lumps' that had appeared on my forehead, he said that by killing then off, it should stop them turning to something worse, I have to say, that although I have had this done before, it hurts, because you don't have much flesh there, and now I have to wait until they scab over and drop off, then apply a special acid cream, that I still have to get from the chemist. That done, we went on a hunt. My life starts each day with hot bread and orange marmalade, I had a hell of a problem when I first came to Colombia, because there was no such thing, they only had what I can describe as orange puree in a bag, it was virtually tasteless, then one day I found they had started to import 'Casino' orange marmalade from France, until recently I could only get it on the other side of Medellin, at Supermarket called Carulla (the equivalent of the UK's Waitrose) the upmarket version of Exito (which is equivalent to the UK's Tesco), where most people shop, they are in the same group. I would buy it four to six jars at a time, so I knew I had it in stock, in the last few months they started stocking it in our local Exito, which was great, it saved me time and fuel costs, but then a couple of weeks ago, I was down to my last two jars, and decided it was time to replenish...Exito, none! and again last week, none, so knowing I was going to Medellin today, I wasn't over worried, I would get it at Carulla, so we went, only to find, they had small jars of, raspberry, strawberry and cherry, but no orange. I think Marcela thought I was going to cry, so she went off to see if they had any in the stockroom, but no, apparently as it is imported, and there was a problem, they didn't know when it was going to arrive, soon they hoped. 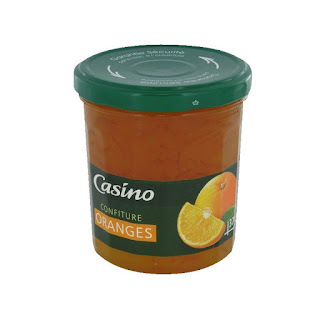 I was getting desperate, so we went off to another Carulla, and by chance sat in the middle of the shelf looking very lonely, were four large jars of Casino, orange marmalade, so we grabbed them all, and I came home happy. I am definitely not letting my stock get that low in future, without that fix first thing in the morning I am useless. I have had toast and orange marmalade every day since I was a kid, the thought of being without, is almost worse, that not being able to buy a decent Cheddar Cheese...almost!